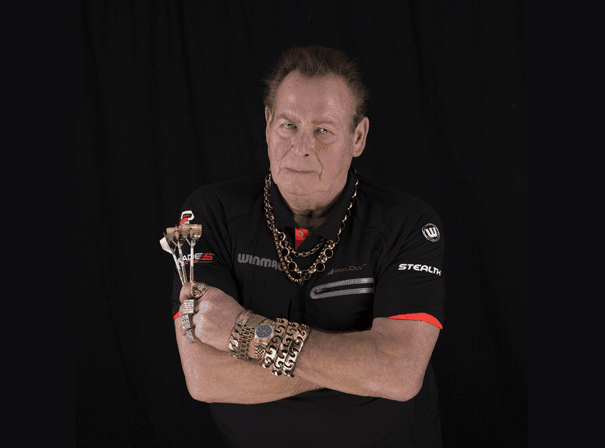 Bobby George is one of the most recognisable figures in the game of darts. A larger-than-life character known as the “King of Blin g”, Bobby is known and loved for his exuberant dress sense, bold jewellery and vocal personality. Hailing from Essex, Bobby first entered the sport I 1976, quickly rising through the ranks to become a professional player of the highest standard. He won several leading tournaments, including two wins at the News of The World Darts Championship, and two appearances in the BDO Darts World Championship finals. Undoubtedly one of the most ebullient personalities ever to play the sport, Bobby was known for his dramatic entrances, often entering as the “King of Darts”, wearing a crown, cloak and jewellery to the tune of “We Are The Champions”. Bobby became a full-time exhibition player (the first of his kind) in 1986, and continues to remain active on the circuit, bringing along his popular “Audience With Bobby” section. Bobby’s charm and charisma has served him well following his retirement from the sport, as he moved on to become a co-presenter for the BBCs darts coverage in 1998. He has been a fixture on British TV during the past two decades, appearing on Brainiac: Science Abuse, Showbiz Darts, Cash in the Attic and more recently, the BBC’s The Real Marigold Hotel, The Real Marigold on Tour and ITV’s Gone To Pot.